HotelMóvil – From Tractor Trailer To Luxury Hotel With The Push Of A Button | OhGizmo! Tired of trying to hunt down a decent 5-star hotel while traveling? Well why not just bring your own next time. While cruising down the highway the HotelMóvil looks like your standard 18 wheeler (well maybe with a few more wheels) but once you arrive you simply detach the cab from the trailer and hit ‘Play’ on a remote control. After a 30-minute hydraulic unfolding process you’re left with a 2-story mini hotel complete with 11 bedrooms, private bathrooms and an outdoor terrace on the second floor. 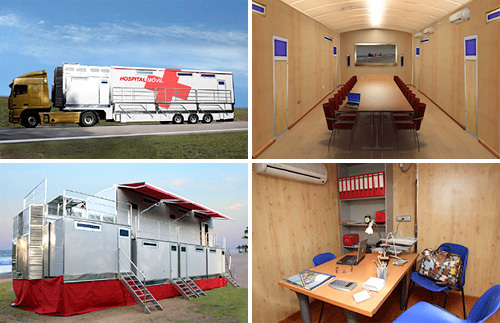 The HotelMóvil can also be custom-built for a variety of other uses including a mobile hospital, a portable film studio and even a school. Optional amenities include heating and air conditioning, flat-screen TVs and internet access via Wifi. A HotelMóvil with a standard configuration will run you about $500,000 but if you don’t need it all year round they can also be rented for around $8,000 a weekend. And unless you have your truckers license you’ll also need to hire yourself a driver before you hit the road. In a couple of years me and my partner would like to purchase one of your highly advanced and helpful HotelMóvil for something that could do me a favor. If you would, could you email me at [email protected] for further details and more information email me. i want to live in one of those!! haha thats an awesome trailer.